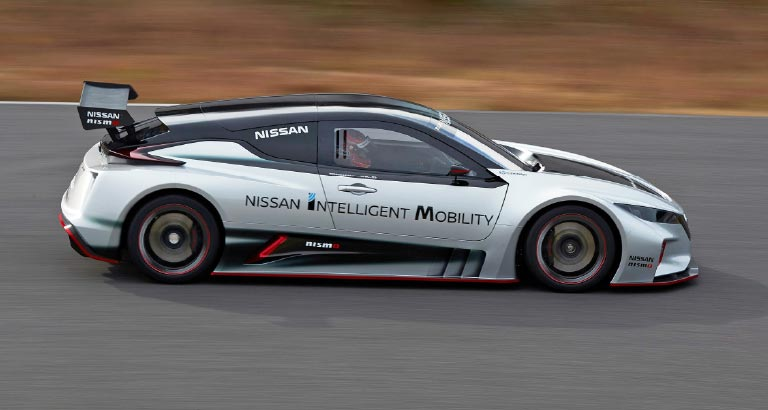 The all-new Nissan Leaf Nismo RC, an electric race car with more than double the maximum power and torque output of its predecessor, was recently unveiled in Tokyo. With dual electric motors, all-wheel drive and an aggressive, restyled body shape, the purpose-built car demonstrates how Nissan’s electric vehicle technology can deliver exciting yet quiet, zero-emission power. The two electric motors at opposite ends of the chassis produce 120kw each and an astounding 640Nm of instant torque to the wheels. They double the maximum power and the torque output of the previous Leaf Nismo RC, which was introduced in 2011. A long hood and Nissan’s signature V-motion grille highlight the totally restyled front end. The distinctive silver-and-black paint scheme with red accents makes the car seem to be in constant motion, even when sitting still at the starting line. The all-new vehicle will be on display at Formula E races, and major shows and events around the world.